Ski touring is the ideal way to explore the French Alps and get some exercise in at the same time. Ski touring (known as ski de randonnée in French) involves hiking uphill on skis in order to reach off-piste terrain otherwise inaccessible via mechanised lift systems. Why waste energy climbing up a mountain when there’s a perfectly good ski lift that can get you to the top much faster and with much less effort? When the adrenalin high of lapping groomed pistes begins to fade, many experienced skiers develop an obsession for untracked powder snow. Off-piste skiing has become incredibly popular in recent years, which means that finding epic, untracked powder fields within the ski boundaries is becoming more and more challenging. 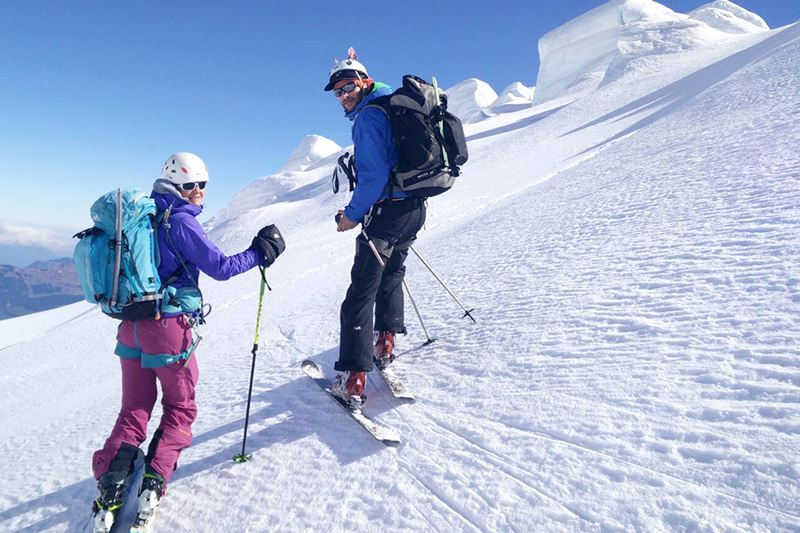 Maintaining that same adrenalin high eventually means going farther from the pistes and deeper into the back country, which is one reason why many seasoned skiers are turning to ski touring. Personal fitness and a yearning for “individual experiences in nature and snowy landscapes” are also important motivations driving growth in ski touring, according to an ISPO report released in January 2018. Essentially, ski touring allows you to access terrain that other skiers can’t, while offering a full body workout in a pristine alpine environment. While its origins hark back to the origins of skiing itself, ski touring has seen a notable increase in popularity in recent years. Why We’re Falling in Love with Ski Touring explores the phenomenon. Combining a love of skiing with a dose of fresh air and a lot of calorie burning; ski touring can take you as far as you want to go. Ski touring can be as easy or difficult as you make it. To begin with, short uphill hikes* off-piste within the ski area will allow you to access untracked slopes that other skiers haven’t touched. You’ll quickly understand the pleasure of working up a sweat and earning those fresh tracks, without any of the pressure or noise of other skiers around you. As your confidence grows, you’ll be able to venture further from the groomed pistes and farther from the crowds. With good levels of fitness and technical ability, the Alps are your oyster! Multi-day itineraries hiking between mountain huts will offer you ultimate freedom in the alpine wilderness. You’ll become used to being the only person in sight and soon forget what a crowded piste even looked like. The risk factor in ski touring is unwittingly putting yourself into an avalanche-prone situation. As you’re in the back country, the terrain you’re on will not be secured by safety patrollers as it is within ski area boundaries, so you need to know what you’re doing. As soon as you leave the safety of a groomed piste, avalanche gear and mountain awareness become paramount. Everyone skiing or touring in the backcountry should be carrying a transceiver, shovel and probe – and know how to use them. Choosing a safe route is key. The decision can be tricky though, as conditions change regularly and a route you skied safely last week might be avalanche-prone tomorrow. We strongly recommend hiring one of our professional, IFMGA certified High Mountain Guides to take you out. At ZigZag, our guides are also more than happy to teach you about route selection during your time with them. Take along a detailed map and they’ll even suggest a range of itineraries you can safely ski on your own. Beware of following unqualified skiers’ advice – your safety is primordial and conditions can change quickly. There are frequently accidents in the back country each winter when experienced skiers find themselves in the wrong place at the wrong time. Book a day of ski touring guidance with an experienced, English speaking High Mountain Guide from our team. If you’re totally new to ski touring, your Guide will accompany you to the rental shop in the morning to help ensure you’re kitted out with appropriate equipment. You’ll then be introduced to the sport gently, being instructed on good technique and practices right from the beginning. Some basic off piste ski skills are require – you should be happy skiing down an ungroomed red level slope. If you feel you need to work on your off piste technique, we recommend first booking an off piste lesson with one of our expert Instructors. A brush When you’re enjoying the downhill ski experience, the uphill will make so much more sense! Your first ski tour will likely be short, aiming to offer you a taste of uphill climbing with a nice off-piste descent as a reward. You don’t need to be a marathon runner to take up ski touring – moderate fitness is enough and you can take it as slowly as you like. For those with ski touring competence and experience, the possibilities are endless. In consultation with you, our IFMGA certified High Mountain Guides will create bespoke itineraries to suit your ambitions, in France, Italy, Switzerland and beyond. To book a single or multi-day guided ski touring experience, simply contact our reservations office with your request and we’ll walk you through the process from there. If you’re looking for tuition you’ll be allocated an Instructor and if you’re looking for guidance, a High Mountain Guide will be reserved for you. All ZigZag Guides and Instructors are English speaking and are selected for their friendliness and approachability – you’ll have a great time in their company. You’ll be advised on equipment rental and a meeting time and place will be arranged according to the route you’ll be skiing. Contact our reservations team to discuss your next ski touring adventure – we have lots of great itineraries to suggest!